A recent letter from a reader who wants to move to Maui asked, “What’s the prettiest town?” I think that’s a very subjective thing, and I can’t choose pretty for you any more than you could choose it for me. A better question might be about the weather of the town you choose to live in. For instance, I was at a party up in Kula, and everyone there was freezing. It was an outdoor party, and the windchill felt about 30°. I was wearing the same leather coat I wear in San Francisco and was still cold. After you live in Hawaii a while, your blood thins out and you can’t take the cold anymore, particularly if you live at an elevation that is always warm. So it really is like Goldilocks, you have to pick what’s “just right” for you, and you alone. Then there are the maintenance fees at condos…ask lots of questions. I was tempted to buy a lovely condo when I first loved here, till I found out the maintenance fees were $1,200. per month– and this was fifteen years ago! Well, you spend your money differently. 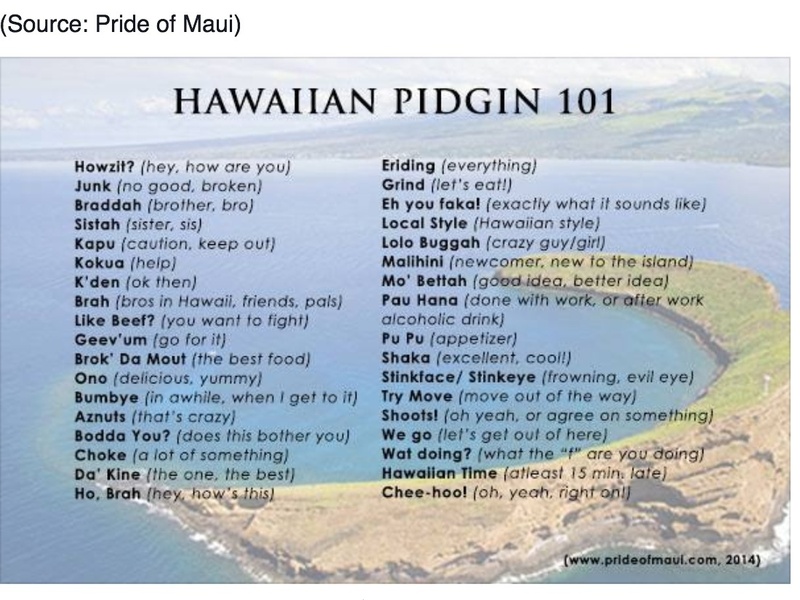 The mainland has all those temptations that Maui doesn’t: Bed, Bath, and Beyond, for instance….which I call “the place with everything you never knew you needed, but have to have.” Same with Bath and Body Works. Wander through a place like that on the mainland and you’re buying those scented pump soaps because they’re five for $25.00 or whatever, and that’s money you hadn’t planned to spend. Now take away Michael’s huge craft store (and Richardson’s). Not to mention Kohl’s, JC Penney’s, Victoria’s Secret….Pottery Barn, Crate and Barrel, Restoration Hardware, The Container Store. And of course, Nordstom and Neiman Marcus (“needless markup”) as my friend calls it. But, you think, I’ll just end up ordering those things online. How will this save money? One word: shipping costs. Recently, I tried to order a sunscreen/moisturizer online that I’ve been using for years. Usually, I buy it when I’m on the mainland and bring it back (just like everything else) but I hadn’t been to the mainland lately. I’d had some luck ordering from them online before, but this time, two little bottles of cream were going to be $45.00 for shipping. (Would have been about $7.95 to ship on the mainland). I pleaded. Wheedled. Cajoled. “Can I just mail you a flat-rate shipping box? That’s $12.00, and I could get ten of those suckers in there!” No, they said. They were sorry, but shipping to Hawaii had gone way up, but most of it was the “handling.” Guess my sunscreen needed to get a massage before they could put it in a box. These are not luxuries, they are everyday items that people on the mainland take for granted. Eventually, you just learn to do without. Eventually you learn to stop wanting. A Pottery Barn chair? That’ll be extra shipping (see the special little “shipping to Alaska and Hawaii” box), then an additional $250.00 just ‘cuz you have the audacity to live on an island. Actually, it’s probably much more than that, because I haven’t bothered to check on Pottery Barn anything in like ten years. So, you think, I’m gonna save a bundle without all these tempations, right? Uh-uh. All that money you’re saving goes right to the high costs of food, housing and gasoline. Before gas prices dropped, World News would say that California (or wherever) had the highest gas prices in the country. They would name some figure like $3.68 per gallon. We would want to throw a shoe at the telecaster. Hello! We’re paying $4.68 over here. Are we not part of the country? Living on Maui, you not only spend your money differently, you think differently, act differently, feel differently. Stay long enough, and this island will forever change you. A flu epidemic has hit Hawaii and a week ago we were told that all the hospital beds on Oahu are full. They are turning away ambulances, which are not allowed to stop. And now comes the news that the beds are also all full at Maui Memorial Hospital. People are being told to just go see their primary physician instead. Which would be okay…except that Kaiser is on strike. And if people are dehydrated, they’re gonna need an IV. I’ve got the flu. That’s why you haven’t heard from me. Everyone says this one lingers.